When I light the Shabbat candles, I find a rare moment to catch up with my inner light and have a quiet few seconds with my soul. I fell in love with Shabbat in Jerusalem. In many ways, Jerusalem is a modern city. For decades, cafes have offered free wireless Internet, ATM’s have communicated in different languages and high-tech companies have manufactured the world’s standard for laser monitors. But in other ways Jerusalem is an ongoing seminar for the soul, where matters of the spirit are ubiquitous and potent. Shabbat is the heart of it. By Thursday afternoon Jerusalemites are wishing each other “Shabbat Shalom.” On Friday morning, we walk faster, choosing challah bread from among the mountains of varieties, flowers from the side-walk stands, and the newest blend from a local boutique winery. In my neighborhood corner store, the shop keeper discusses the weekly Torah reading as he rings up my bill for humus and horseradish. Outside, an Arab woman named Aisha is peddling bunches of mint, dill and coriander. When I pay her, she too wishes me Shabbat Shalom. In Jerusalem, whether you are more casual about the rules for Sabbath observance, or like me, observe them devotedly, you can’t miss the transition into the distinct time of Shabbat. Inside my home, an apartment on the third floor of a stone building in a residential neighborhood, the transition also takes place. On Friday afternoon, the phone rings exactly as I’m separating the whites and yolks. Urgent text messages and e-mails bring requests from editors trying to do a final edit so they can leave for vacation. A helpful grandchild wants to set the table and drops an oversized bottle of grape juice on the just-washed floor. But as sunset approaches, the stickiness is gone. My apron comes off. The aroma of cinnamon, cumin and dill fills the air. I take a moment to look at my table with pleasure: white tablecloth, purple flowers, green napkins, crystal wine goblets, wedding china. An embroidered cloth covers two braided challah breads, reminiscent both of the giant loaves baked for the Ancient Temple as well as the double portion of manna that fell on Fridays in the desert to sustain the Israelites during their sabbath rest. This is Jerusalem. The site of the Ancient Temple is only a mile away. Everything in my home must be ready before sunset. For 25 hours, I won’t light a flame , turn on a light or cook food on the Biblically mandated Day of Rest. Timers adjusted by my physicist husband will turn off and on the electric lights. I usher in Shabbat with my last active use of fire: lighting candles. There’s a common misconception that everything spiritual is mind-based. 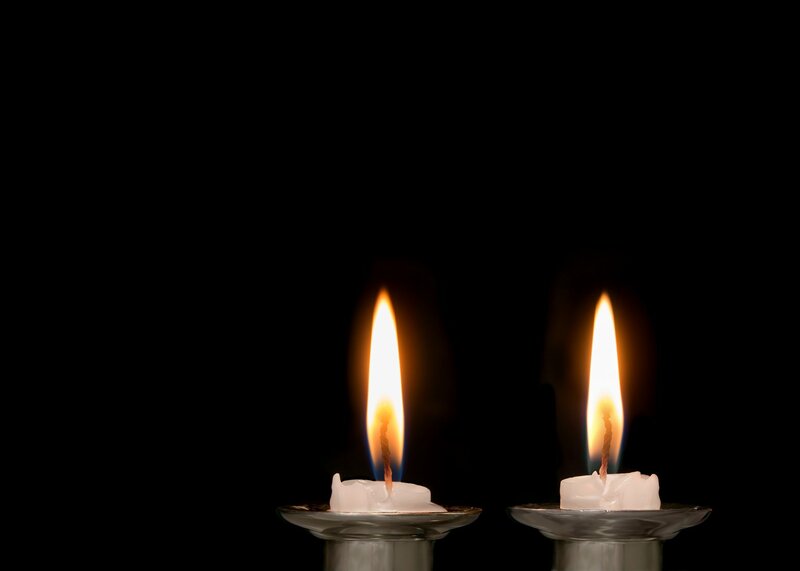 Shabbat candlelighting might be a spiritual moment, but it’s a physical act, and it teaches us that practical deeds of goodness and kindness, not just good thoughts and spiritual intentions, are important. In my home in Jerusalem, it works like this. Out in the living room, I wave a quick hello to the guests who have gathered. “Candlelighting!” I announce. Imagine yourself shouting, “Last call—the plane is about the take off.” This is a flight, too. A spiritual flight. A woman’s prayer over her candles has been compared to the prayer of the High Priest in the time of the Temple as he entered the Holy of Holies. Daughters and daughters-in-law, granddaughters and guests gather around the old Colonial marble-topped table that once sat in my childhood home in Connecticut. It’s stocked with matches and extra candles, and underneath there is sequestered the smallest of wine racks. The candlesticks are silver, a simple design, sitting on a round silver tray. I light seven, two is the minimum and I’ve added one for each of my five children. Behind the candles, a mirror is mounted on the wall, because I love to see the light of the candles magnified, dancing in all directions. Outside, the sun is setting. The traffic has dissipated on my street. Inside my home cell phones, CDs, TVs, radios, hairdryers, clothes driers, are finally switched off. When I became a Sabbath-keeper at age 26, giving up the phone was the hardest part. And back then I had a single land-line. Who knew that decades later separating from my smart phone would be the greatest liberation? First we’ll light the candles and then we’ll say the blessing with our eyes closed. This is because we do not actually light candles after our prayer has brought in the Sabbath, when starting a fire is prohibited. I help my small granddaughters and any guests who are lighting for the first time and are unsure of what to do. Then I turn to my candles and become a lamp lighter. As we women light the candles, our fingers make inward concentric circles over the flames to bring the light into ourselves. In those moments with my eyes closed I become the matriarch Sarah, wife of Abraham, who four thousand years ago lit candles in her tent. I am her daughter-in-law Rebecca, who has come to marry Isaac and to bring light back into the tent. I am the women crossing the Red Sea, making music with the tambourines they had the foresight to pack because they believed that there would be cause to sing. I am the Spanish woman during the Inquisition, lighting her candles in a cellar closet to escape detection. I am my once-upon-a time elderly landlady Else Bamberger, who once said her blessing over two stars as she caught the boat from Europe to freedom just before the Holocaust. I am my grandmother, who carried her brass candlesticks from Poland into a new world without oppression, and my mother, who sometimes lit candles and sometimes didn’t in a modern American home. I am a bride, a Queen, like the Sabbath itself. But I am mostly me: a woman standing in her Jerusalem apartment, feeling privileged to be able to set forth a table that at the same time represents the Biblical Table of the ancient Temple and a modern repast of fellowship for those who join me on the Sabbath. In that moment of lighting, I am bound to women past and future—one link in a long chain of candlelighters of which I am now a part. But it is also the most personal moment of my week, a moment pregnant with my specific prayers for my family, for me, for healing, for peace—all compressed into this moment of lighting Sabbath candles. According to tradition, the heavens are open to the prayers of women at candlelighting. This is the right time to make demands of the Creator. The preciousness of candlelighting isn’t solely because our grandmothers might have lit candles. Simply passing something along isn’t enough to make it so cherished. Just as the simplest candle transforms physical wax to metaphysical light, so I can elevate my life from the mundane to the ethereal. Here is that rare moment to catch up with my inner light and have a quiet few seconds with my soul. I leave behind my working life and move into sanctified time. I drop any slavish attendance to attend to phone calls, faxes, taxes, e-mails, junk mail. I’m free of supermarket lines, fast-food lines, traffic jams, and the clamor of TV and radio. The people with whom I’m about to break bread and talk and sing are all close enough to reach out and touch. I am wireless, as the light of my candles blends with the hidden light of Creation. Barbara Sofer is the Israel Director of Public Relations for Hadassah, the Women’s Zionist Organization of the World. She is a columnist for the Jerusalem Post and the Jerusalem Report, and the author of seven books, the most recent of which is A Daughter of Many Mothers, with Holocaust survivor Rena Quint. She is married to scientist/writer Gerald Schroeder.